I am constantly on a mission to 'get organised'. If there's a new fad that promises to save you time and guarantee you won't miss an appointment or forget something vital on your shopping list, I'm a captive audience. Generally though, a few weeks in and I've either lost interest or managed to find a flaw in the plan. In my head, I love being organised, but in real life, things don't tend to go to plan. I'm a big sucker for stationery and notebooks, which made me think that keeping a bullet journal, or BuJo, might actually be a workable solution. Basically, a bullet journal combines your diary and all your to-do lists, bucket lists, birthday present lists and any other thoughts you have into one handwritten notebook. It seemed like the perfect solution to the woman who seems to juggle several notebooks as well as a diary, usually missing the vital notebook for the occasion. I couldn't commit to the index. The index page (at the front of the bullet journal) is essential to make it a workable system. If you want to continue a list, you use the next available page, which might not be the next consecutive page, and then you mark the page number in the index. I was hopeless at writing page numbers on each page and not particularly good at adding this information to the index, which meant I could never find the page I needed. 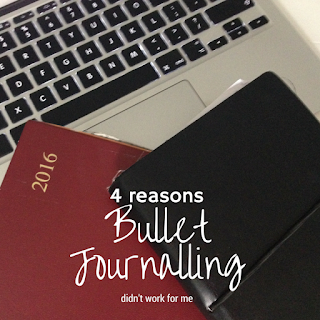 The system is flexible, but not flexible enough for me (or maybe I wasn't flexible enough for the bullet journal system). The index page is integral to the bullet journal; you just add information on a page and the index enables you to find it. But I prefer to be able to just flick to a section and have all the information in one place, rather than have to flick between pages to find all the relevant details. I tried to get round this, by ditching the notebook and using an A4 ring binder, and that kind of worked. The only problem was that the folder is too big to carry around every day. Instead, it sits on the kitchen table, so it's more a family organiser and planner than a true bullet journal. And this meant that I was writing random lists on bits of paper, which is really not the point of a bullet journal. I'm not arty enough. To get inspiration and to try and make my bullet journal work for me, I joined a couple of Facebook groups. I was inspired by the really amazing and artistic spreads and trackers created by other bullet journallers, but my own attempts were more functional. I'm not arty. I can't draw to save my life. And I got overwhelmed and disheartened that I just couldn't produce anything near so pretty. I didn't have enough time and I lacked the commitment needed to make it work. I think to get the most out of a bullet journal, you need to devote time to filling in the pages and making them look good. My own use of the bullet journal was more rushed. To make a bullet journal work, you need to use it pretty constantly. You need to spend at least 20 minutes every night sorting out your life and your bullet journal for the next day. I do most of my organising on the hoof - often while feeding the baby. Trying to write in a notebook while breastfeeding a curious toddler is, quite frankly, impossible. So I started using electronic apps on my phone - well, my Google Calendar mainly. So I was ending up with some information in my phone and some in my bullet journal. And I didn't have the time to tally them up. Things came to a head when I got to the end of my first BuJo notebook. The thought of transferring the vital information scattered across multiple pages in my original notebook scared the crap out of me. And I really didn't fancy carting two or three notebooks around. So I added the BuJo fad to the long list of failed organisation attempts. Coincidentally, it was at this moment that I discovered an online organisation app called Trello. It's an online project management tool, which I started using at work. But I soon realised how helpful it could be in my personal life. Basically, you create a board for particular project and you then add cards to detail the specifics. Each card has options to add comments, a checklist and even attachments. There are also 'power ups' that enable you to link due dates with your online calendar, which I haven't explored yet. 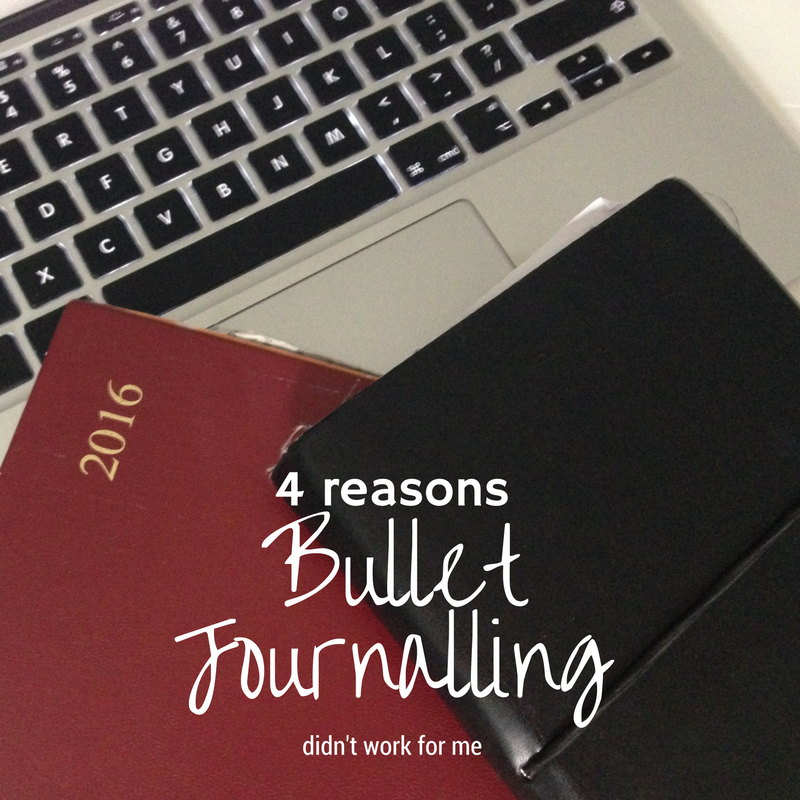 I love the concept of the bullet journal and I can see how it is an amazing tool for some people. But sadly, not me. What organisation systems work for you in managing your life?